Warfare skill + non-Source elemental skill book + InkPot and Quill = Brand new skill! Very very special thanks to Dr. Valisk, M.D. for the brand new pretty icons! They're wonderful! I felt that there weren't enough combinations of skills for this game. It made me trying to create a Warfare/Pyro hybrid a real drag. 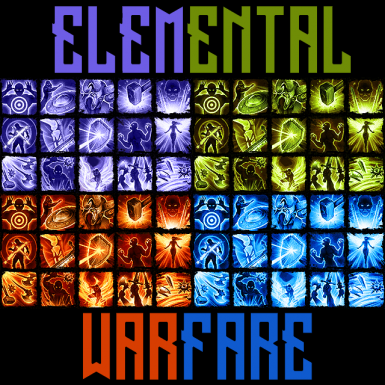 All 15 Warfare skills can now be combined with a Ink Pot and Quill (not consumed) with a non-Source elemental skillbook, for a brand new skill. Don't make the skill totally brand new, keep the warfare skills theme. Don't make the skill just plain better than the warfare skill. Let the skills scale based on weapon, allowing your cool fire warrior to use a sword if you want. Try and keep it balanced.